The Regina Folk Festival is set to return to Victoria Park for its 47th year this summer, and the initial list of performers has finally been unveiled. Topping the bill are the Head and the Heart, a collaborative set from Ry Cooder, Sharon White and Ricky Skaggs, Sam Roberts Band, the Mavericks, Bettye LaVette, the Cat Empire, and the Strumbellas. Also slated to perform throughout the weekend are Bobby Bazini, the Barr Brothers, Ayrad, Boogat, Terra Lightfoot, Ginkgoa, isKwé, the Wet Secrets, Al Simmons, Matt Epp, the Royal Foundry, Nick Faye & the Deputies, and Megan Nash. In addition to the music, attendees will be treated to extra entertainment like a children's area, arts market, beer garden, rock garden, festival record store and international food vendors. 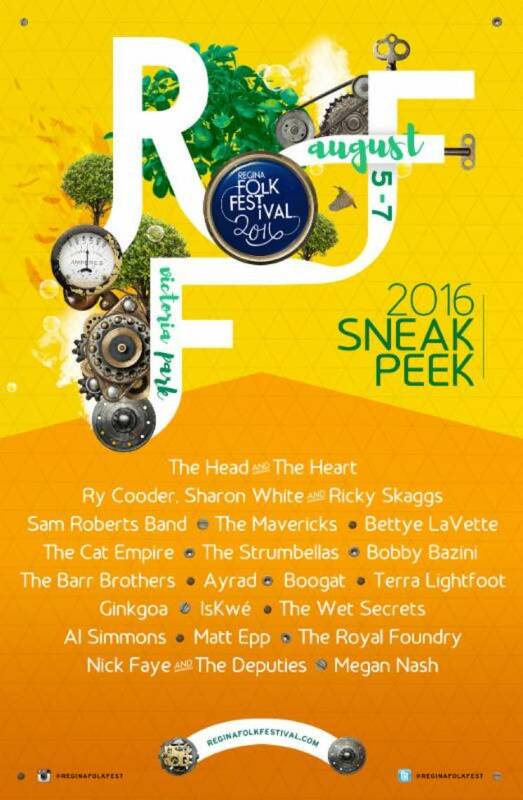 RFF runs from August 5 to 7. Tickets are on sale now, and you can find full information at the festival's official website.